Summer is the perfect time to make renovations to your bathroom. 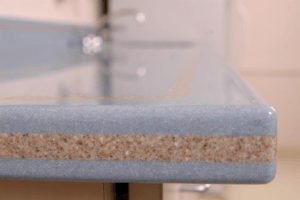 If you’ve been dreaming of tearing out your old bath enclosure or installing a new bathroom countertop, there’s no reason to wait any longer. Just follow these 5 tips for making your bathroom renovation project go smoothly. Or a big vanity, as the case might be! Despite the name, vanities aren’t just there to show off – they make your morning routine easier and more comfortable, and also provide plenty of space for storing grooming essentials like makeup, lotion, and soap. If there’s more than one person living in the house, consider installing a vanity with more than one sink – it will make things less crowded, and save time by letting two people get their morning grooming done at once. Bathrooms should have plenty of light to make it easier to see and create a welcoming atmosphere. Particularly important is “task lighting,” or the light fixtures that provide illumination for the sink/mirror and other locations where it’s important to be able to see. The best task lighting is the kind that doesn’t produce any shadows, which can be accomplished by installing one or two light sconces at eye level on opposite sides of the mirror. Also, try to avoid putting light fixtures directly above the mirror, as they will create long shadows across the surface that will make it harder to see. When designing a bathroom layout, it’s incredibly important to leave enough space between fixtures. Without the right amount of space, it becomes difficult to move around, and the air won’t circulate properly. Pathways and spaces between fixtures should be at least 36 inches (or 92 centimeters). If you have the space, try to go as wide as 42 inches (107 centimeters). Toilets are an essential part of any bathroom, but they aren’t the most pleasant things to look at. The best way to deal with this problem is to give toilets their own little compartment, with a small wall creating a separate mini-room for the toilet away from everything else. If that’s not possible, at least try to position the toilet so that it won’t be in your line of sight when using the sink or bath. One of the best ways to make sure bathrooms are properly ventilated and get plenty of fresh air is to install at least one window. Positioning is important, of course – you don’t want to have a window placed where anyone standing outside can get a glimpse of your private business. One way around this is to position the window higher up on the wall in a way that it lets in light and air, but still hides the contents of the room from view. Looking for bathroom renovation supplies? 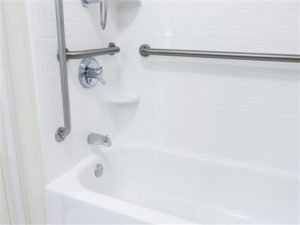 American Bath Enterprises Inc. specializes in top of the line shower kits and bathroom stalls, including ADA-compliant layouts. For more information, contact us today at 888-228-4925.